We’ve spent quite a bit of time this year talking about Saudi Arabia’s rather precarious financial situation. To be sure, the move to artificially suppress crude prices has at least partly served the kingdom’s interests in terms of market share and geopolitics. The US shale space has felt the screws tighten and even as wide open capital markets have helped even the weakest players stay in business, production is falling and for the most uneconomic producers, it does indeed appear that the music may finally be about to stop. As for the “ancillary diplomatic benefits” (i.e. the geopolitical angle) of collapsing crude, the Russians have undoubtedly felt the squeeze and when considered in tandem with Western economic sanctions, one has to believe that the pain from low energy prices has been very real indeed for Moscow. On balance though, it looks like this was a bad gamble for Riyadh. ZIRP has kept the US shale space in business far longer than the Saudis probably imagined would be possible and instead of forcing Putin to give up Assad, Russia instead built an air base at Latakia and plunged headlong into Syria’s civil war on behalf of the President. Meanwhile, the fallout from “lower for longer” has been a disaster for the kingdom’s finances. 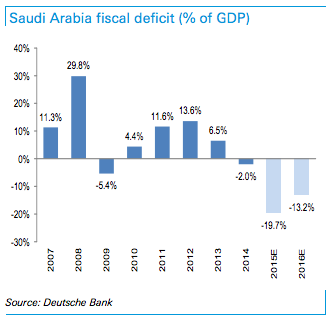 Saudi Arabia’s budget deficit is expected to come in between 16% and 20% and for the first time in ages, the country faces a deficit on the current account as well. The largest energy subsidy beneficiary is the end-consumer in the form of fuel (petrol) subsidies. Bringing up the price of petrol to levels in the UAE, which earlier this year eliminated the petrol subsidy, could provide the government with USD27bn incremental revenues, or 20% of the budget deficit. However, this is a highly unlikely scenario given the demographic differential between KSA and UAE and the socio-economic impact that such an outcome (blended prices rising from USD0.11/l to USD0.5/l) could have within the country. The Saudi government could look to increase electricity tariffs. This would be a challenge for residential consumption (51% of aggregate consumption) given the political/social impact, though it would present the highest incremental revenue benefit. Bringing up the electricity rates for industrial/commercial consumers to UAE levels could raise incremental revenues of USD3bn, which, while higher than those from the chemical sector feedstock impact, is still only 2.3% of the budget deficit. Water is another area where the government could raise more revenues. Currently consumers pay only SAR0.1/cu meter for consumption of 50 cu.m per month, which is one of the lowest in the world. For oil, however, the most crucial point is what happens to Middle East currencies and in particular to the Saudi Riyal. In fact, Saudi Arabia’s FX reserves are still high and point to an ample buffer for now, but they have been falling at a relatively fast rate (Chart 21). However, should China allow for significantly faster FX depreciation than is currently priced in by markets, we believe oil prices could fall further. Naturally, the FX reserve drain on Saudi could accelerate to $18bn per month if Brent crude oil prices average $30/bbl (Chart 22), sharply reducing the Kingdom’s ability to retain its currency peg. 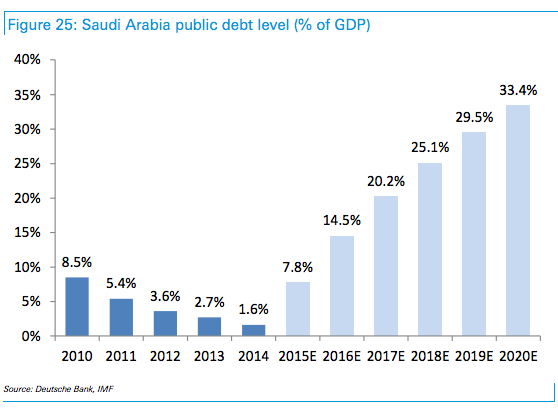 Saudi has been forcing prices lower by increasing production into an oversupplied market so far (Chart 23), and it also rushed to issue debt in its local market to fill a soaring budget gap. We have previously argued that Saudi Arabia’s surging output is responsible for almost half of the 520 million barrel global petroleum inventory build in the last 7 quarters. Can the government maintain this strategy of flooding the oil market? In our view, it is unlikely that Saudi leaders would want to exacerbate its ongoing reserve drain by pushing prices below $40/bbl. After all, pressure will quickly build on the riyal’s 30 year peg to the USD (Chart 24) if Brent crude oil prices keep falling. And frankly, it is a lot easier politically to implement a modest supply cut at first than allow for a full-blown currency devaluation. 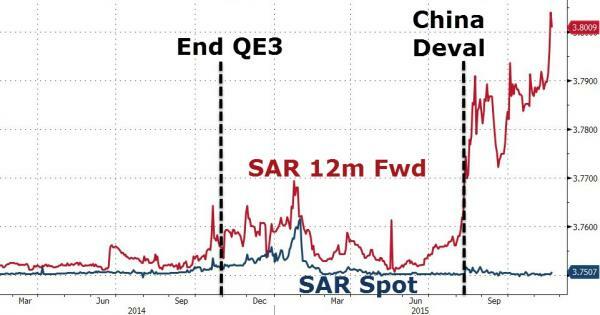 But a CNY meltdown could ultimately force Saudi’s hand. In short, a depeg of the Saudi riyal is our number one black-swan event for the global oil market in 2016, a highly unlikely but highly impactful. However, if Saudi cannot resist the gravitational forces created by a persistently strong USD and depegs the SAR to follow Russia or Brazil, oil prices could collapse to $25/bbl. Weaker commodity prices would in turn add more downward pressure on EMs (Chart 26). Thus, even if micro supply and demand dynamics are improving, the path for oil prices in 2016 will heavily depend on how the USD moves against the CNY and the SAR. Or on a Saudi supply cut. And there you have it. It's either stop it with the whole flooding an oversupplied market strategy, or let the peg fall before SAMA runs dry. Bear in mind that it's not just falling crude, the peg, and generous subsidies that are weighing on the Saudis. There's also the war in Yemen and the prospect of a stepped up role in Syria. 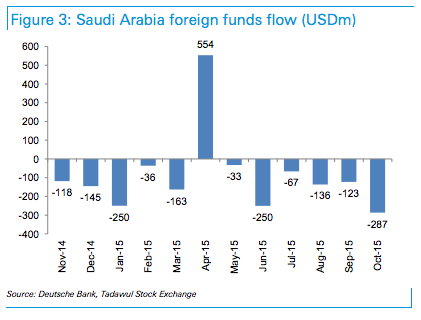 Finally, note that October saw investors pull nearly $300 million out of Saudi equities - that's the largest outflow of the year. 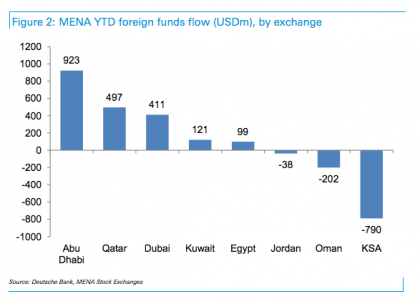 As Deutsche Bank notes, "given the growing macro pressures confronting Saudi Arabia (fiscal deficit at 20% of GDP this year) and disappointing Q3 reporting season, foreign investors pulled out funds worth USD287m." So there you have it. The consequences of keeping the world flooded with "lower for longer" crude in an effort to preserve market share and cripple a geopolitical rival while simultaneously maintaining i) subsidies for the oppressed masses, ii) a currency peg, and iii) a proxy war. BofA's contention is that this ultimately is not sustainable. The only question now, is whether BofA's black swan thesis does indeed play out, because if the Saudis relinquish the peg and crude plunges to a 20 handle, you're going to see a veritable EM meltdown.